The MIDAS Series 3 (Military Defense Alarm System) satellites, MIDAS 3, 4, 5, were the third development models for the MIDAS early warning system. The Series III carried an improved Aerojet-General infrared payload. It featured a Bouwers concentric telescope with an 8-inch aperture. The detector array on the surface of the focal-plane assembly contained 184 lead sulfide detectors arranged in eight vertical columns of 23 detectors each which provided complete vertical coverage of a 24-degree 58-minute field of view. The 2.7-micron system provided both spectral and spatial background rejection, and emphasized boost phase detection of missiles in the "Atlas class." The telescope rotated on its spin table at 6 rpm, like its Baird-Atomic predecessor. The basic spacecraft remained unchanged from the Series II, except for reliability upgrades. The Agena-B upper stage of the Atlas-LV3 Agena-B launch vehicle was used as the spacecraft bus and provided power and attitude control to the MIDAS payload. Two deployable solar arrays were mounted on the aft equipment rack of the Agena-B to provide power. On 17 December 1962, MIDAS 6 was launched, but the booster vehicle veered off course after 80 seconds. On 9 May 1963 MIDAS 7 ascended from Vandenberg AFB and successfully achieved its planned, circular polar orbit at 2000 nm. Moreover, the spacecraft performed all but flawlessly for the next six week, at which time it powered down as seasonal changes reduced the sunlight intercepted on its fixed direction solar arrays. During this period MIDAS 7 detected all of the ballistic missiles launched within its field of view and relayed the data to a control center in Sunnyvale, California. These missiles included not only three liquid propellant Atlas and Titan ICBMs, but off-line tapes also revealed detection of seven lower radiance solid propellant Minuteman and Polaris missiles. The Aerojet Series III payload achieved an operating radiance level sensitivity, with signal-to-noise, of 50 kw/STR. MIDAS technology was undeniably demonstrated; payload performance markedly exceeded expectations in the detection of solid-propellant rockets, and background radiation posed no serious problems-false target alarms Were negligible. The Lockheed-Aerojet missile detection satellite was fully vindicated. MIDAS 8, launched on 12 June 1963 failed again when the Atlas booster malfunctioned during ascent. MIDAS 9, launched a few weeks later on 18 July, achieved the desired 2000 nm orbit, but one of the two Agena solar arrays did not extend. 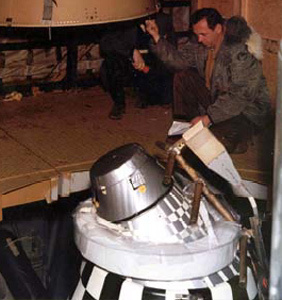 The infrared payload, nevertheless, operated successfully for 96 orbits and detected one American missile launched within its field of view, as well as Soviet missile launch activity, before a power failure terminated the mission. R. Cargill Hall, Space and Missile Systems Center: NRO History: Missile Defense Alarm – The Genesis of Space-based Infrared Early Warning, 1988.